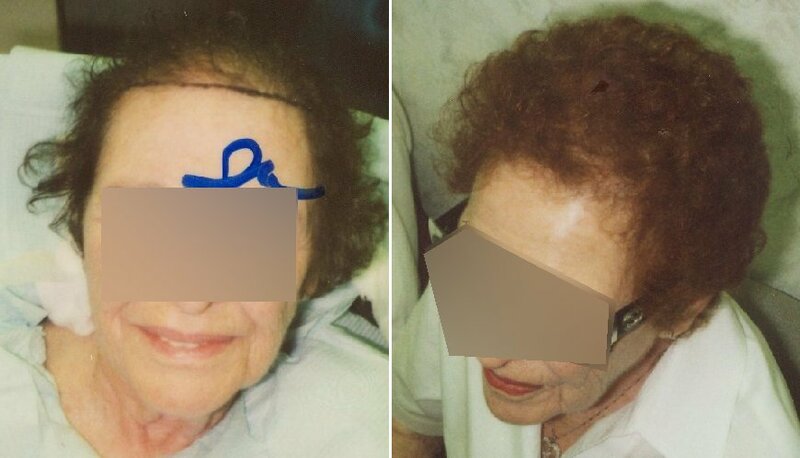 Real Unretouched: Our pictures of women and special cases are not touched up and reveal a honest results. 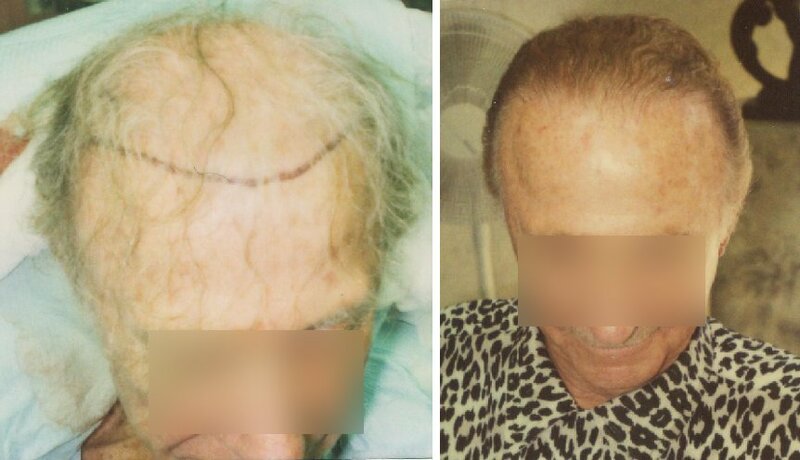 We don't have a fancy studio background, but simply took pictures before/after surgery and during followup checkups. 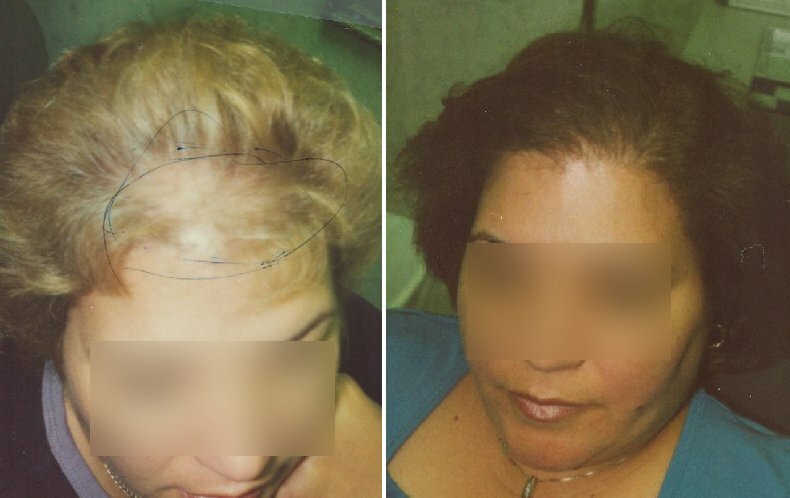 We have 1000's of pictures and you are welcome to come in and look at all of them. 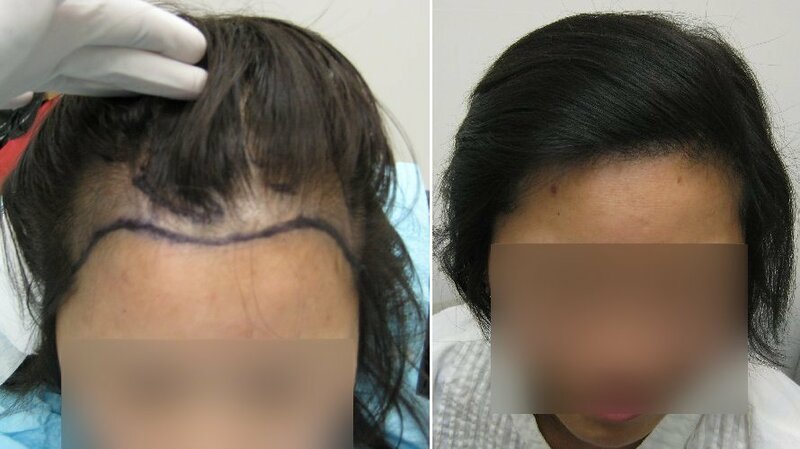 Watch our video on Hair Transplants for Women and see the blog article on woman's hair loss causes. 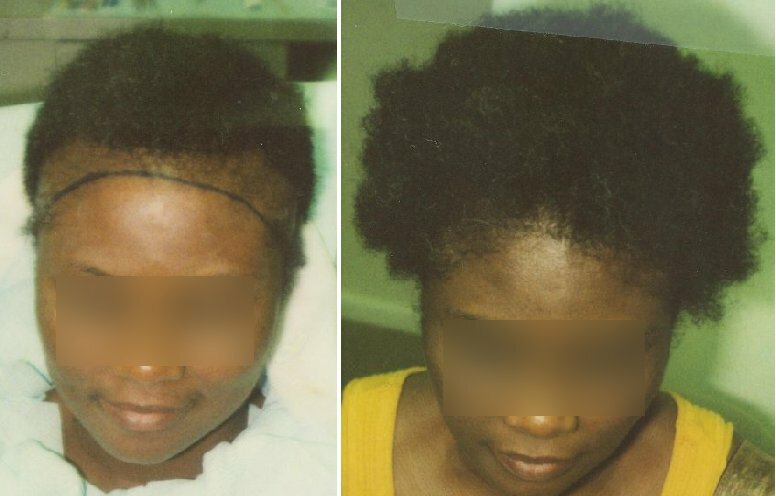 See How we grow Hair Faster with AFR™! 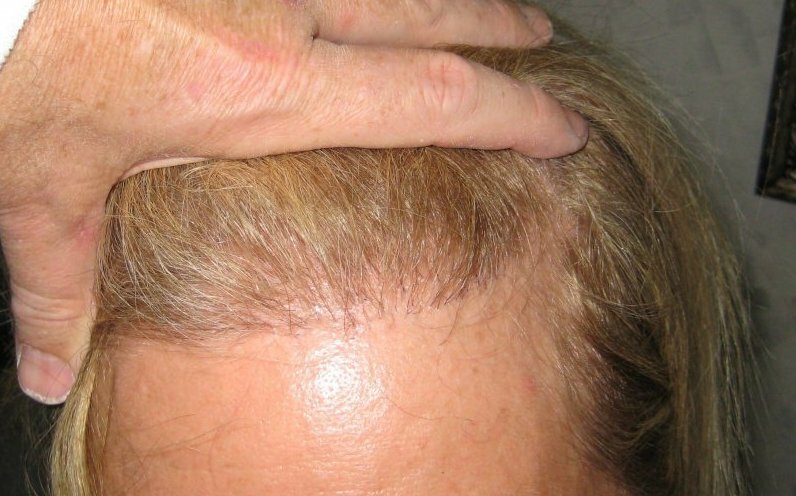 See 1000's of Men's before and after Hair Transplant Photos. 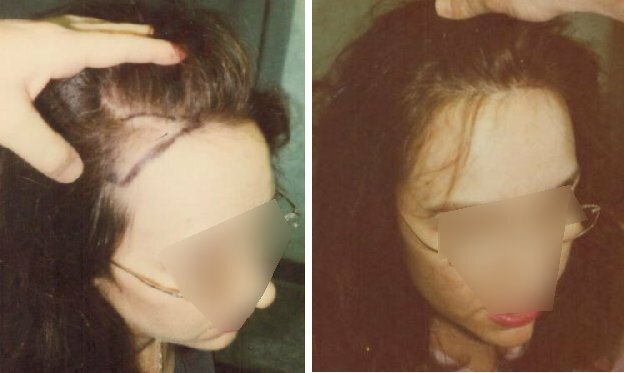 Hair loss from years of extensions and wig wearing. 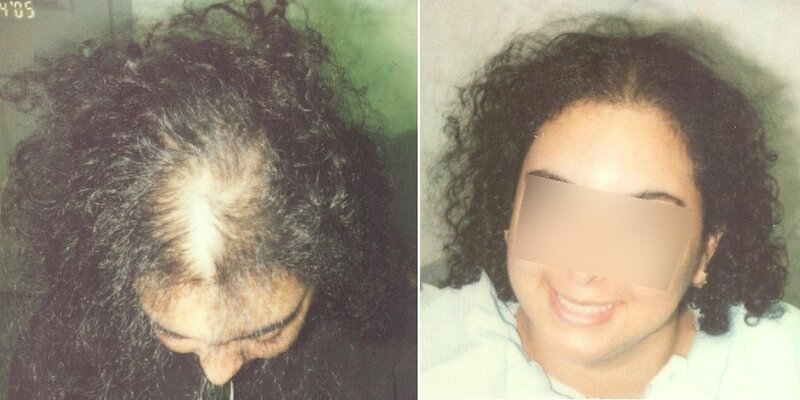 Hair loss from flat iron and hot oil treatment. 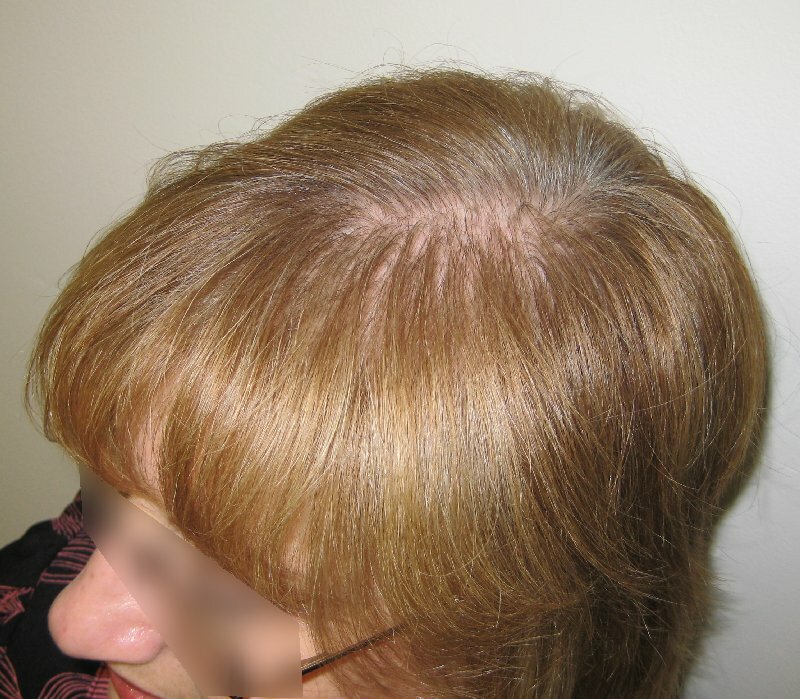 Hair loss from multiple pregnancies. 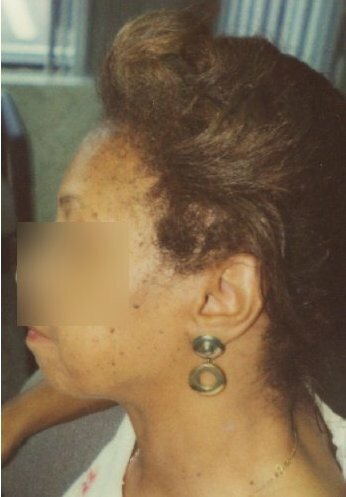 After 6 months growth. 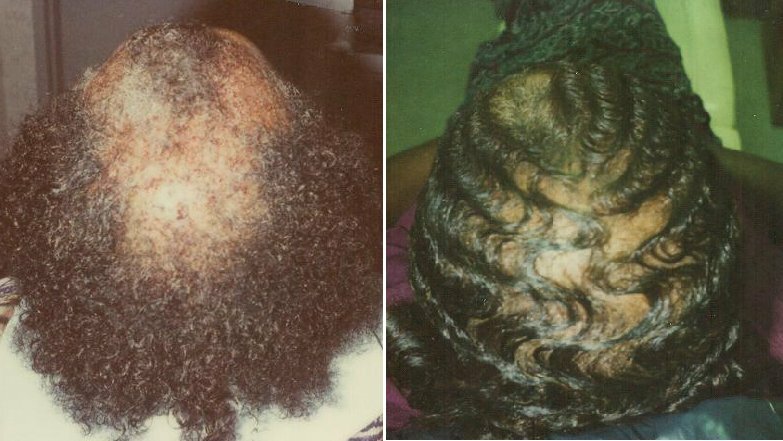 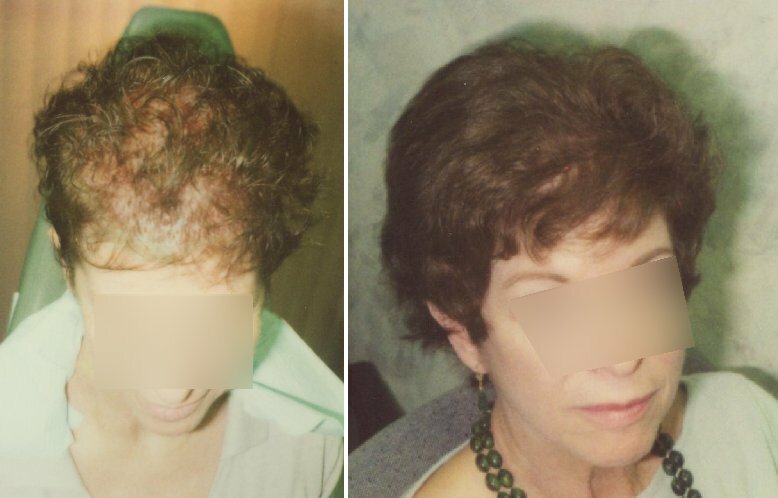 We added the AFR™ program to this woman's treatment resulting in shorter dormancy in the weeks following her hair transplant - resulting in full growth at 6 months. 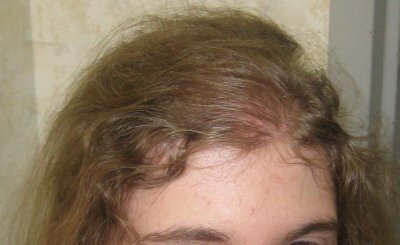 After 6 months with AFR. 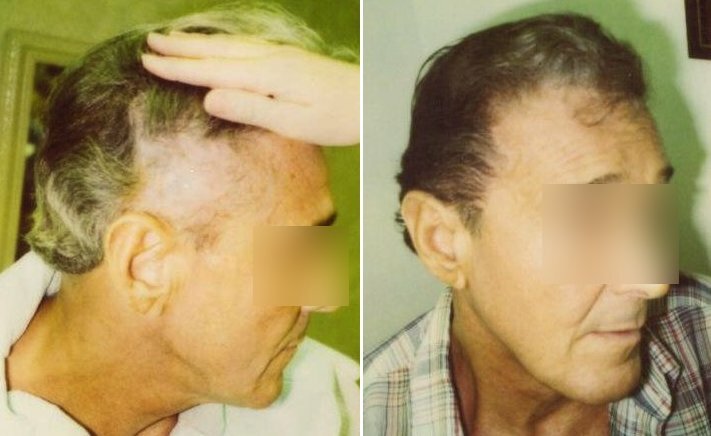 Before/After Hair Transplant on plaque psoriasis patient. 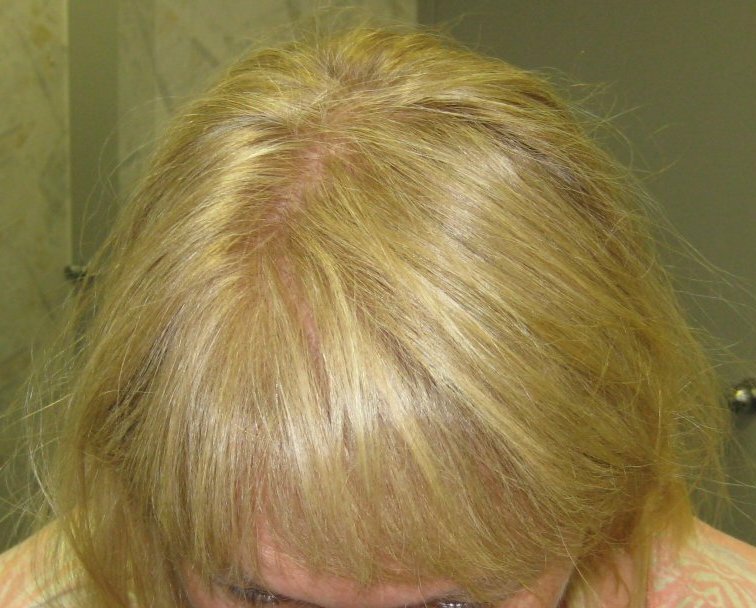 Patient had motorcycle accident after 1st sitting, hair grew anyway with AFR™ program. 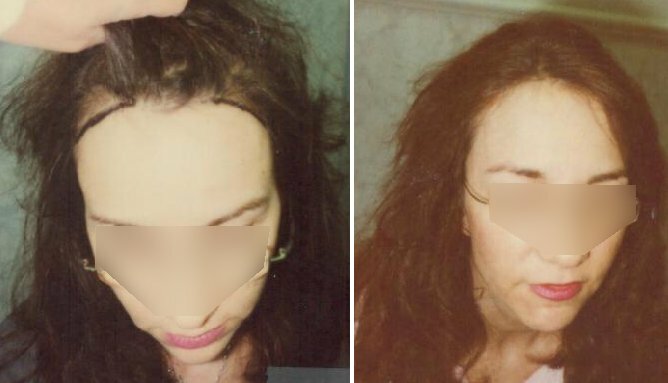 After 4 months (2nd sitting). 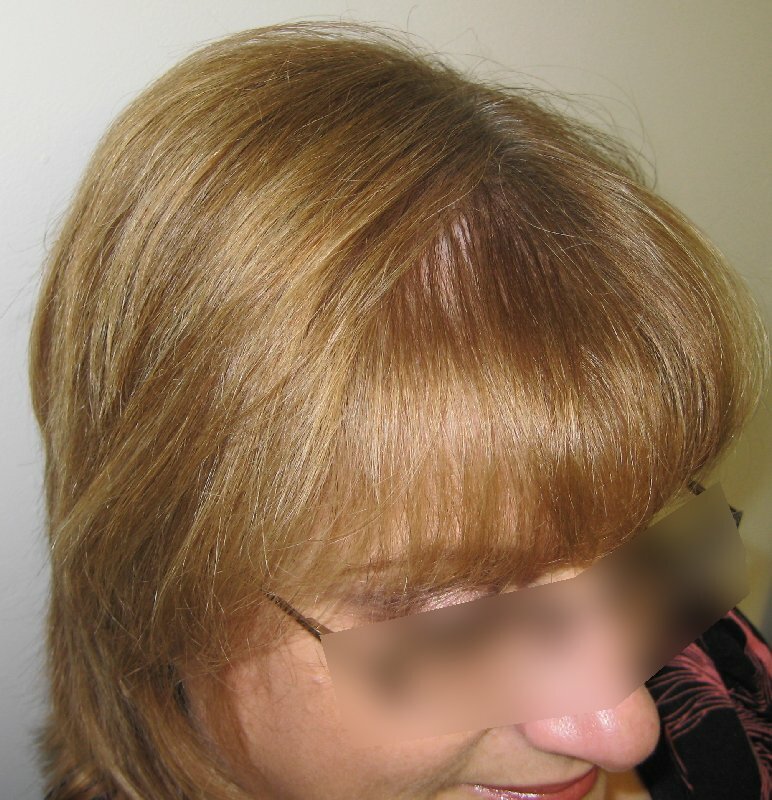 Repair/restoration hair transplant after a browlift damaged this lady's hairline. 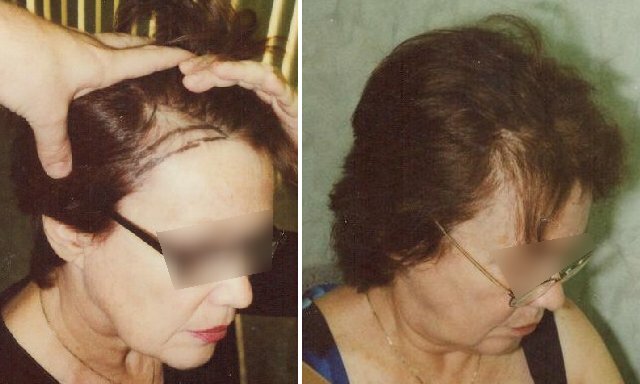 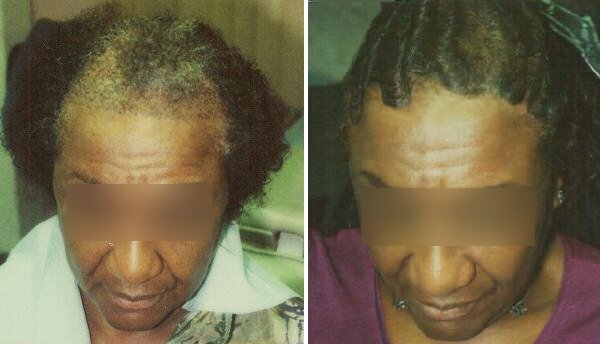 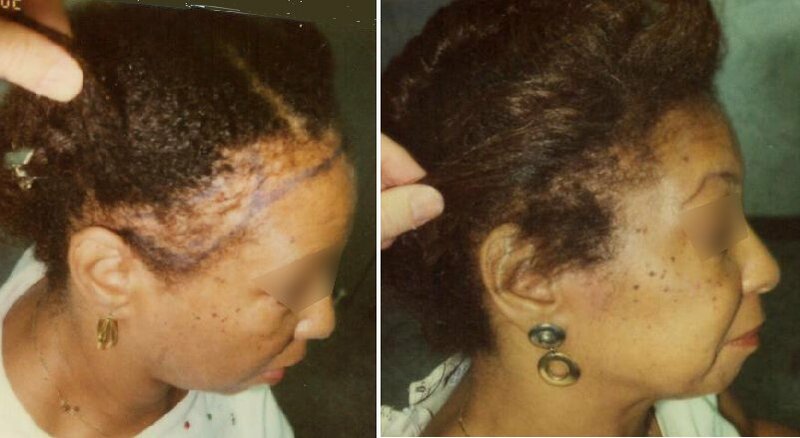 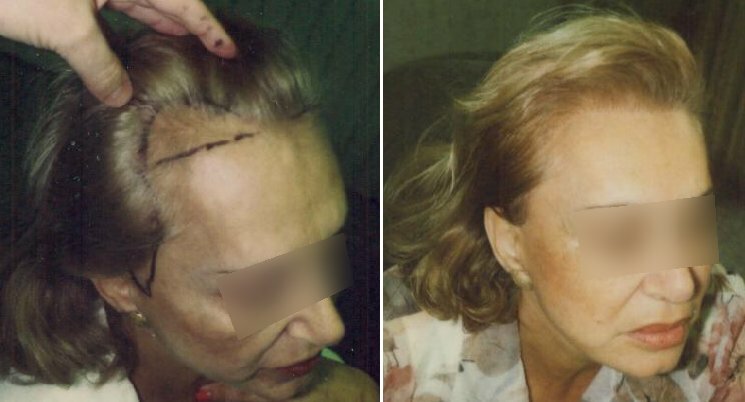 Repair/restoration hair transplant after a facelift damaged this lady's hairline and the area above her ears. 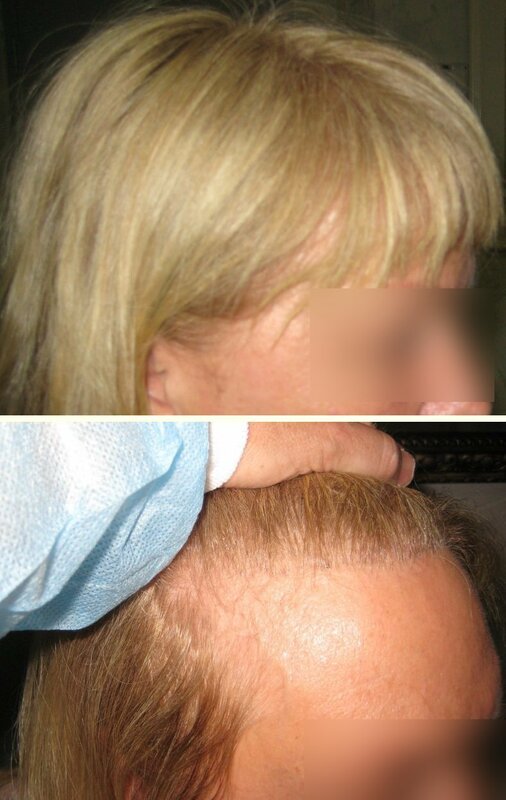 After Hair loss due to extensions, click photos for enlargements. 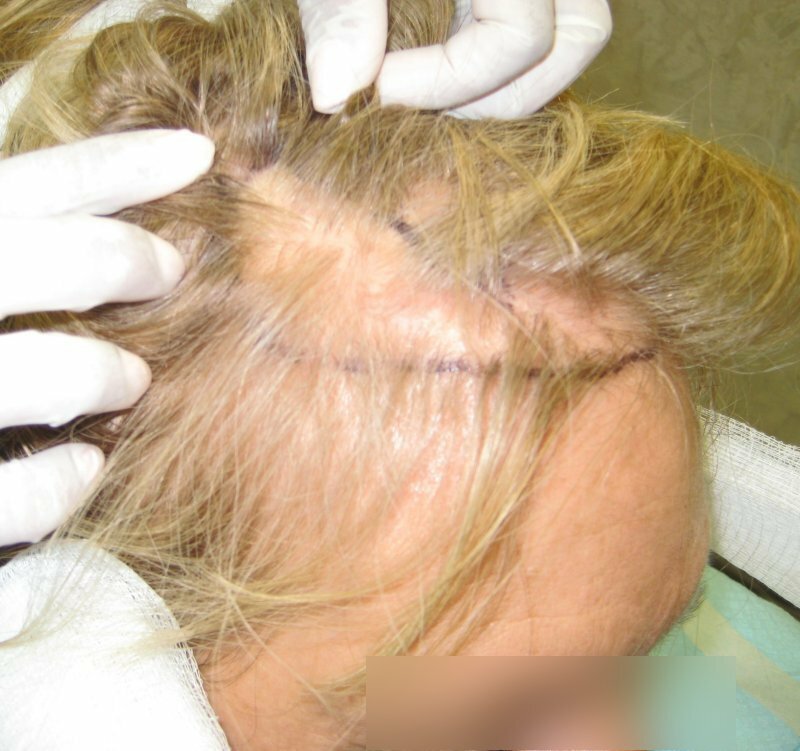 Hair transplants repaired hair loss after hair extensions. 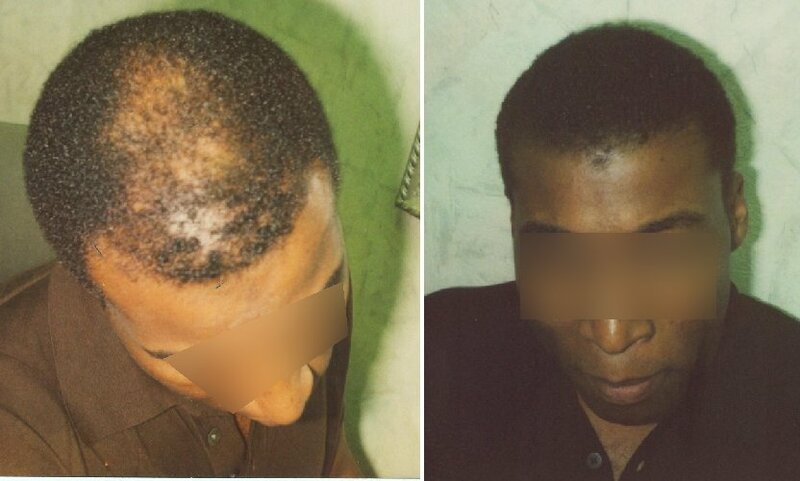 Hair transplant to repair hair loss due to chemical burn from use of hair relaxant. 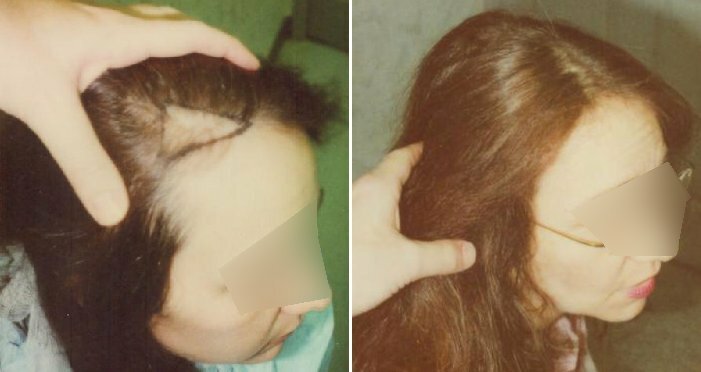 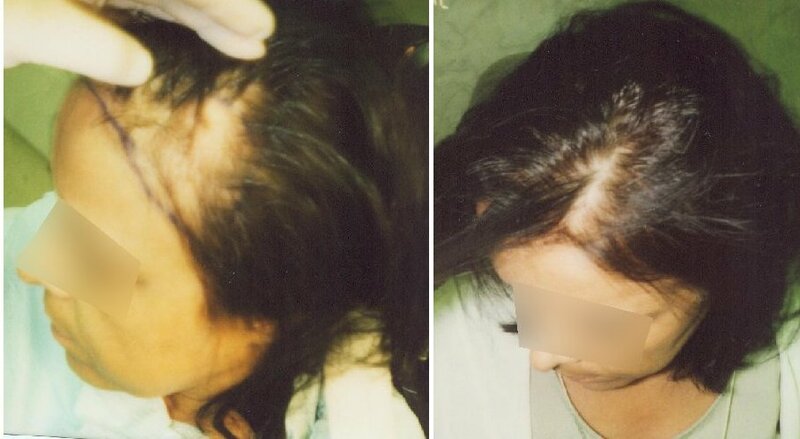 Hair transplants repaired hair loss caused by a thyroid imbalance for this woman. 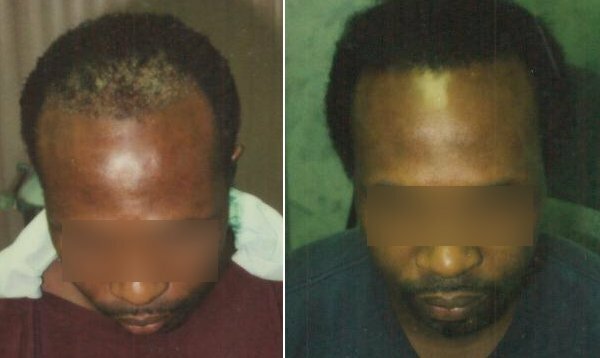 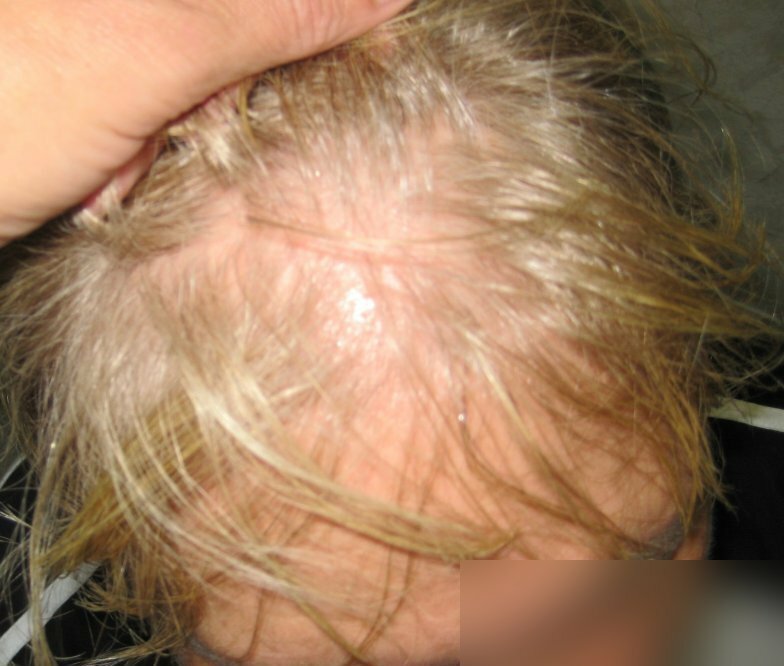 This patient had a chemical burn on his scalp from a hair relaxer and lost his hair -- the hair transplant repairs that damage. 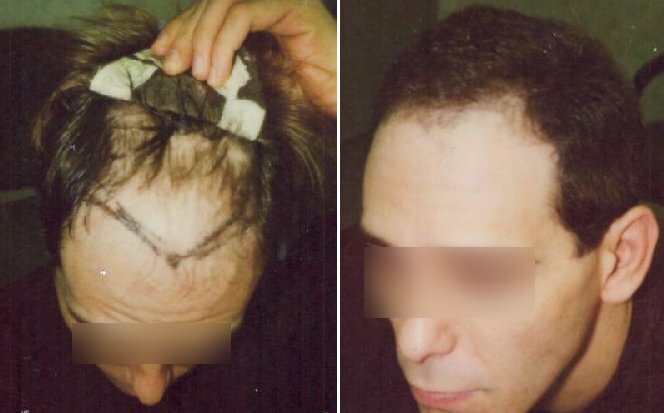 This man got his hair transplant to repair hair loss due to a wig adhesive damaging his hair. 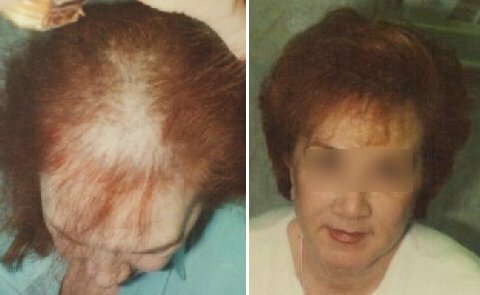 We can work on small receded areas to make you look years younger! 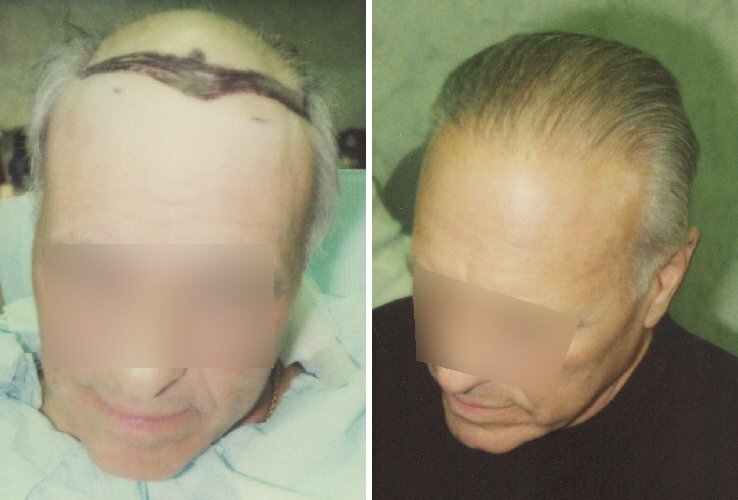 A facelift destroyed the hairline for this man. 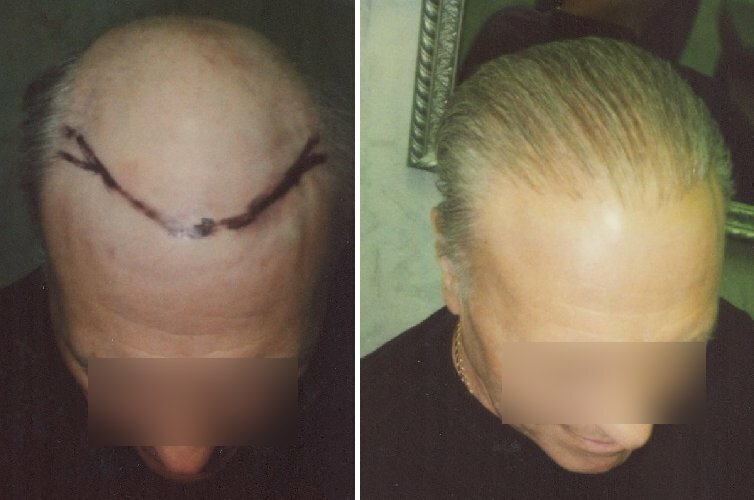 Hair transplants repaired the damage. 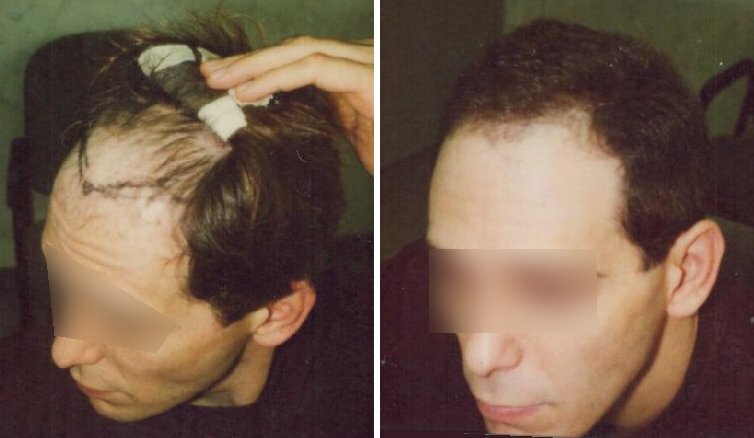 Repair because he lost his hair from taking muscle builder supplements. 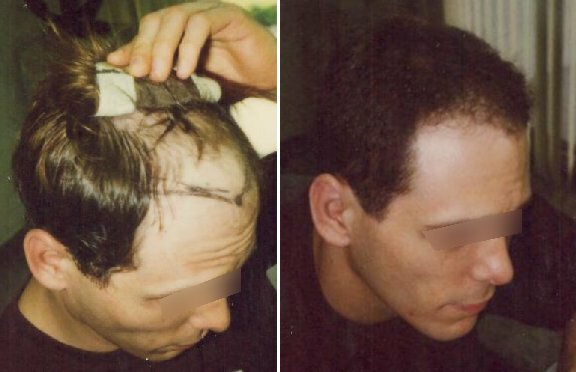 Transplant repairs because he lost most of his hair due to medications. 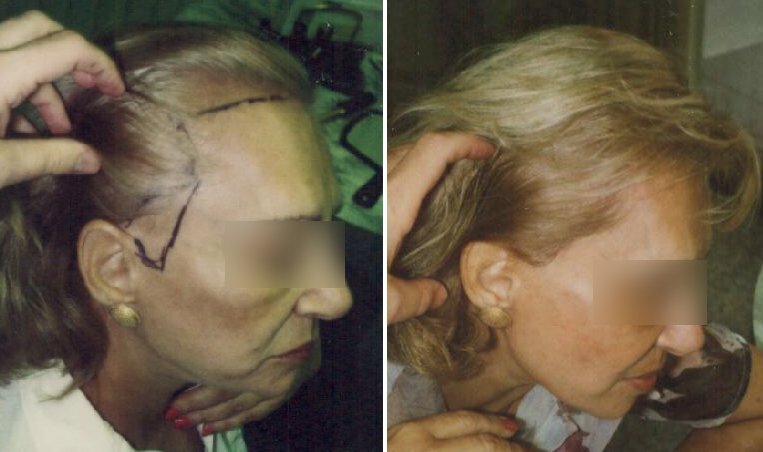 As low as $3-$4 per graft!